Pebbles Interfaces Archives - Touch Display Research, Inc.
On July 16th, 2015, Facebook’s subsidiary Oculus reported that it just acquired Israel-based Pebbles Interfaces. Based in Israel, Pebbles Interfaces has spent the past five years developing technology that uses custom optics, sensor systems and algorithms to detect and track hand movement. Pebbles Interfaces will be joining the hardware engineering and computer vision teams at Oculus to help advance virtual reality, tracking, and human-computer interactions. Although Oculus didn’t report how much they paid for this acquisition, rumors hold Oculus spent $60 million. In the past, Pebbles has received a total of $11.5 million from investors. This Oculus acquisition is a handsome pay off for the previous investors. Figure: Pebbles Interface gesture control. In the “Touchless Human-Machine-Interaction” 2014 report, Touch Display Research has profiled Pebbles Interfaces in the report. Touch Display Research believes touchless human-machine-interaction (HMI) is the next big thing. Apple, Google, Microsoft, Amazon, Samsung, LG, Intel, Qualcomm are all working on touchless HMI. They had acquired or will acquire small companies with touchless technologies. From mobile phone to automobiles, from digital signage to home/building automation, from notebook PC to wearable devices, touchless human-machine-interaction is gaining momentum. 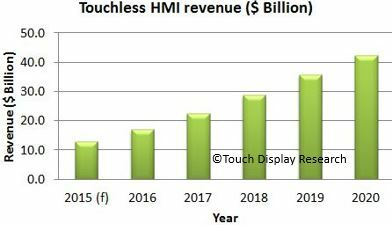 Touch Display Research forecasts the touchless HMI market will reach $42.6 Billion by 2020. Figure: Touchless human-machine-interaction market forecast. 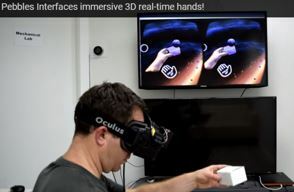 This entry was posted in Gesture control, touchless control and tagged aquires, facebook, gesture control, oculus, Pebbles Interfaces, touchless, touchless human machine interaction on July 18, 2015 by jennycolegrove.